Are you looking for a quick yet stylish way to keep pictures, prints, and other postings updated? 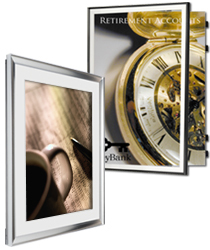 These swing-open frames provide an elegant look no matter where they're hung. The variety of finishes and construction materials means that you will be able to find the poster cases that best match your existing interior designs. Wall-mounted graphic holders like these are typically made from wood or metal and come in a wide selection of sizes. This way, finding the right swing-open frame for a specific wall or environment is easy. Of course aesthetic benefits aren't the only perks of these poster & print displays; they're also incredibly practical! 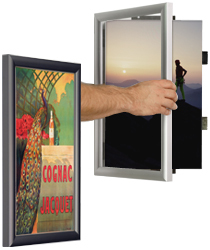 These poster cases, also called swing door framing displays, can be updated with new graphics in just seconds! Each design opens from the front using a hinged door so the user doesn't even have to remove it from the wall when changing out prints. The poster frames with swinging doors also feature acrylic lenses and locks to help keep your promotional prints safe from tampering. With all of these helpful characteristics, it's hard to say no to one of the wall-hanging poster showcases! What types of swing open frames are available for purchase in this category? 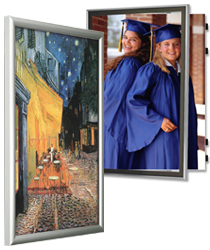 We have wooden or metal poster cases frames that are built specifically for smaller notice and sign sizes, while our larger options are built to hold wide and tall postings. These are sold in cherry wood, black or silver aluminum finishes. 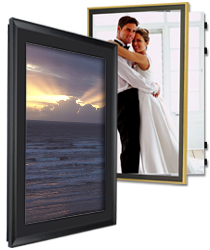 Our series of thin-profile aluminum frames come with black or white matting and are finished in gold, silver, or black in most cases. 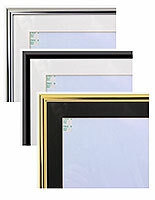 The wide-profile aluminum frames do not come with matboards, but are also typically finished in gold, silver, or black. Our wooden frames come in very similar designs, including thin with matting or thick without matting, but the largest sizes are a bit smaller than the metal units. Choose from finishes such as matte black, mahogany, cherry, or honey maple. We also offer specialty frames sizes specifically for newsprint and newspaper pages that come in such finishes as black or silver aluminum, as well as matte black, cherry, mahogany, or natural wood finishes. What are some other common features of these swing-open poster displays? 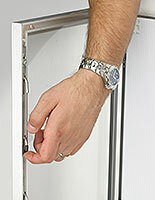 The swinging door is operated by hinges that are kept hidden away beneath the outer metal or wood framing. This design offers a stylish look while ensuring that people are far less likely to break them open. 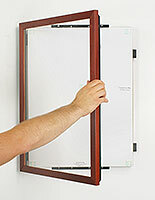 These sign holders are built to be wall-mounted in the portrait orientation due to the swinging door. We have many options that work well with landscape oriented images available as well. The swinging frames may come with matting and security locks. Be sure to read the information on the product page for details on specific models. An acrylic overlay is built in on the door of every print holder, which keeps your ready made postings protected from accidental damage or tampering (locking models). Installation is simple and can be accomplished in a matter of minutes, so you can start displaying art almost as soon as you take the framing out of the box. Changing out your posters is truly simple with these wall-mounted displays. All you have to do is unlock the frame (on plunge lock or gravity latch designs), pull out the old notice and slide in the new one, then close and re-lock the frame. When changing your displays is that easy, you have the ability to keep your art prints and promotional signs updated as often as you need to, even several times in a day. Along with the easy image updates, the combination of elegance and practicality also helps make sure these hanging showcases can be used in a number of places to hold many different notice styles and prints. One of the places they're commonly found is in retail stores, holding advertisements for newly arrived products or upcoming clearance sales. The ability to update images frequently makes them a practical choice for keeping customers in the loop for what's going on in the store. Other places such as libraries, town halls, or community event locations can utilize these picture displays to broadcast information in a central location, such as an entryway or main lobby, about upcoming events that their patrons may be interested in. They're a common sight in movie theatres, lining the main entrance with glossy movie posters advertising the newest releases and summer blockbusters. The elegant design, however, means that they also can be found in such locations as professional office suites and other similar spaces, showcasing company accolades or designer art prints to enhance the interior design.